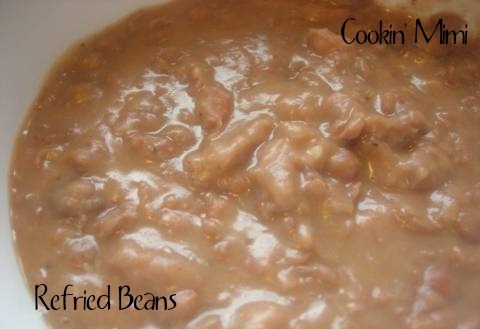 I love refried beans, especially homemade refried beans. Unfortunately I don’t usually have the foresight to make a big batch and freeze them so it’s almost always the canned ones for us. This month I actually used my head for something other than a hat rack and when we had pinto beans the other night instead of cooking just one pound I made two pounds and turned the leftovers in to refried beans. This more of a method than a recipe because I never make refried beans the same way twice. Sometimes I put in onion or chili powder. Sometimes I use vegetable oil, other times it may be a bit of bacon fat if I have any. 1 Tablespoon oil or bacon grease. 1 small onion , diced. a fat of some sort which is optional. Shortening , vegetable oil, bacon fat. Whatever is handy for you. You don’t need much maybe a couple of teaspoons. Heat oil or bacon grease in a large skillet. I am going to use some of the beans in tostadas for tonight’s supper and will have the recipe posted tomorrow. 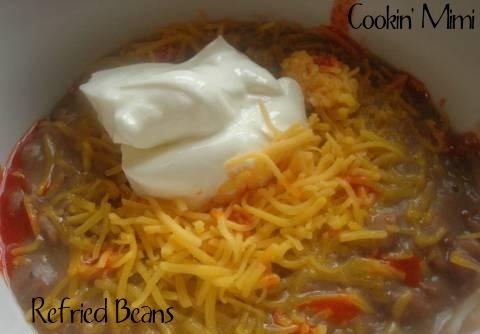 Freezer instructions: Portion cooked, cooled beans into 2 cup portions. Label and freeze. When ready to use thaw in fridge and reheat in a saucepan over low heat until bubbly. Umm you are making me hungry. It all looks so good. Thanks Tina. I have the same reaction when I go to your blog. Here’s a tip for more “authentic” frijoles refritos: blend your beans with their liquid (while cold or room temperature. NOT while boiling hot. Bad idea. Voice of experience.) in your blender or with a Braun (not sure what you’d call it, but I call it my “vroom vroom”. lol). Then, heat up a heavy skillet or pan and put in a drop of lard, bacon grease or oil and one whole jalapeño pepper. Let the pepper sizzle a bit, move the melted grease around a bit to coat the bottom of the pan, lower the heat to low and pour in your blended beans. Cover and let simmer. You can fish out the chili, or leave it in for some daring soul to sample! I’m looking forward to checking out your other posts!!! I think you’re talking about an immersion or hand blender. I think I need one just to try this. Thanks for stopping by.